Offshore Catamarans by Bell Composites, Inc is one of the oldest custom catamaran building companies in North America. We specialize in Custom Design, Construction and Consulting. This website is a great resource for reviewing examples of what we can design and build; however, it is important to remember that you are not limited to what you find on the site. With all of our boats, we start off with a general concept for the catamaran, then work closely with the client to design exactly what they want. We are a catamaran design and construction company that caters to the client that wants something unique and custom. Thank you for your visit to our Website and our world of Offshore Catamarans. 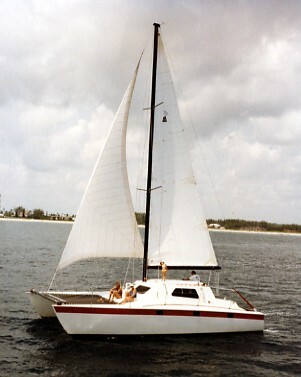 My sailing life started in 1970 as the sailing instructor at Sapphire Bay Resort on St. Thomas in the U.S.V.I. and I have been a catamaran fanatic since my first ride on a Hobie Cat. I have personally been building catamarans since fall of 1975. 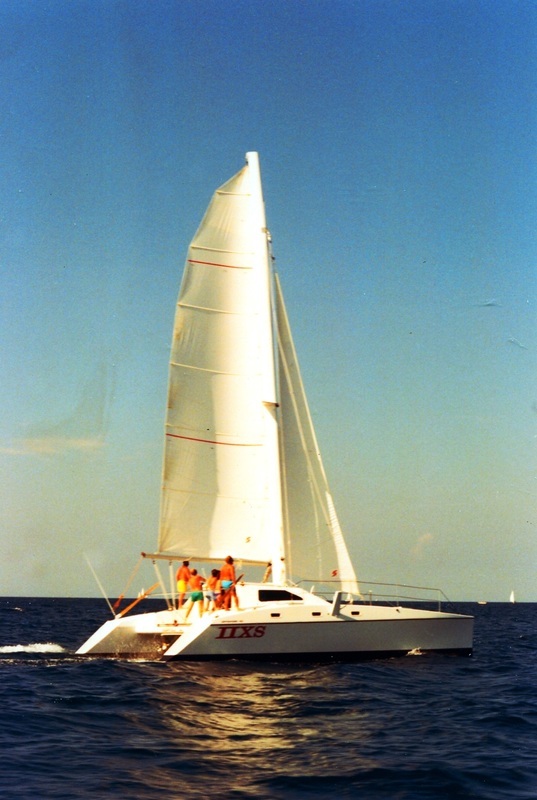 My first project was a Lock Crowther designed Spindrift 37 high performance sailing catamaran, SUNLIGHT DRIVE. I built this for my wife and myself and it was the start of my life with composites. ​I started building Offshore Catamarans in Palm Beach, Florida in 1984 with my version of the Crowther Super Shockwave 37, which is the OFFSHORE 38. I had a great partnership with Lock Crowther and learned a great deal from him. Lock passed away in 1993 and left a legacy of superior catamaran engineering and design. 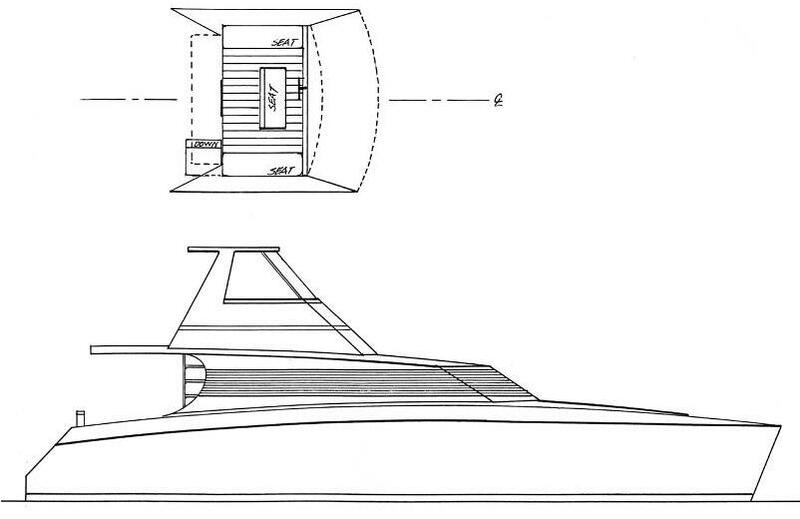 I have been fortunate enough to build more Crowther-designed catamarans in North America than anyone else. In 1989, we won the SPI Composites Institute's Marine division Grand Prize for my OFFSHORE 40 Sailboat IIXS. Burt Rutan won that same year for his Beechcraft Starship in the aviation division. To date I have built large catamarans ranging in size from 37 to 60 feet, all of which have been built using advanced epoxy composite techniques. ​Before I started building boats I was involved in the epoxy resin business in both marine and aerospace areas and I still maintain close ties with the major manufactures of epoxies for the latest developments. One of my clients in the 1970s was the world renowned CSK Catamarans, Rudy Choy, in Newport Beach, California. We were one of the first builders in the world to use vacuum bagged epoxy laminates. All of our vessels have utilized a PVC foam core in hulls, decks and crossbeam structure. The use of a thick, but lightweight, core of PVC foam creates a very strong, stiff and very light craft. Two layers of fiberglass in epoxy resin is not very stiff, however, add a light weight PVC foam core between each layer and the strength and stiffness goes up dramatically. This core also gives flotation, insulation, is fireproof and is very durable. These cores never absorb water and cannot rot like wood cores. The use of epoxy resins also means very long life and never water blister like cheaper polyester resins. We only build in epoxy. ​We have built ocean racing, charter and cruising yacht catamarans for clients around the world. We have boats sailing from Hawaii to South America. Our boats have logged thousands of ocean miles and have always brought their owners home safe and sound. In 1995 we built a 48 foot charter catamaran here in Florida then trucked to Branson, MO for finishing and now SPIRIT OF AMERICA sails on Table Rock Lake. In fact, we have built several large catamarans that are totally demountable for shipping. We have also built composite wing masts for several of our boats and as replacement masts for other clients. Visit Lake Geneva in Switzerland and chances are you will see some sailing. We have been contracted to produce parts for not only catamarans, but also undersea, aerospace and medical projects. ​Offshore Catamarans offers options customized to what you need, from plans, epoxy, materials, or boats built to any stage of completion. We also offer consultation services, along with arranging inspections and surveys of existing vessels. We invite you to study the photographs and our design plans on this web site. We can do everything from a stock design to a new custom design. We can make your dream a reality. A reality you can cruise the world on. From sketch to ocean. This is an overview of the process of having a custom boat built. The three separate steps are Plans, Costs and Build. Plans All boats start with a good set of plans. The better the plans the better the finished boat. 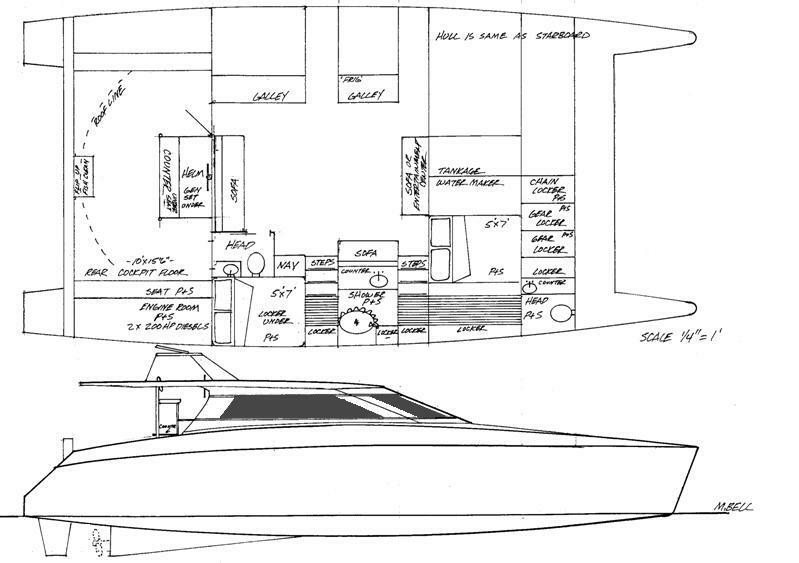 The basic plans cover the general layout of the boat. Length, beam, draft, interior, deck, sail plan, hull structure, power, rigging and hardware. Most plans do not have details on electrical and plumbing systems as this varies with the finished boat. All boat owners make changes and all of these changes are not part of the basic plans. 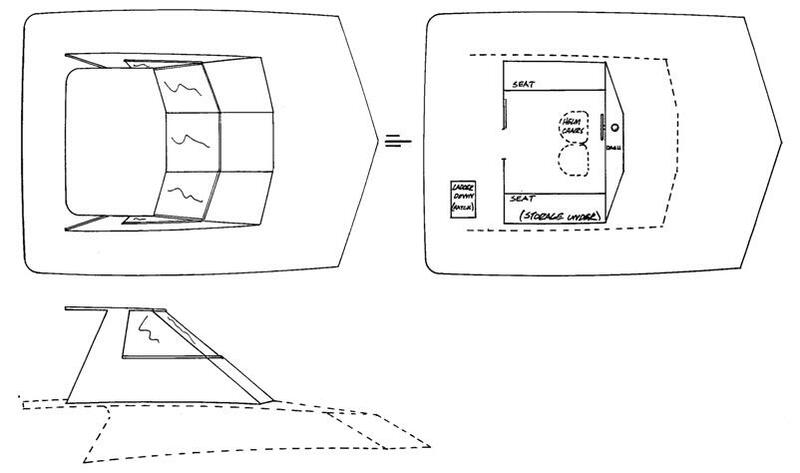 An example is to have advanced electronics systems designed into the boat. This would be an extra expense to the client. In fact all changes from the basic plans would have an extra design cost. Costs Once the plans are completed a line item search by the builder for pricing (cost out) of the materials and parts needed to build the vessel can be done. This process is not part of the basic plans and is an extra cost to the client. This enables the client and builder to fully understand the items needed to produce their vessel. It is from this material/parts list the estimated cost of the boat can be projected. It is at this point a budget should be set for each section of the boat. An example is the mast. An aluminum fixed mast at $20,000.00 or a rotating carbon fiber wing mast for $100,000.00. What is in the budget? Build With the plans researched and a budget known it is at this point the client and builder decide to start the build of the vessel. A deposit is due from the client at the start and monthly billings start for funds spent. This shows a clear monthly view of progress. All boats are built on a materials, labor, site and other costs formula. Other cost range from insurance, shipping, boatyard, site rental, launching, sea trials and any subcontractor costs for added equipment and labor. Here at OFFSHORE CATAMARANS we strive to give our clients not only the highest quality in structural integrity by utilizing composite technologies, but also give them a boat that meets all of their needs and wants. Because all of our work is custom, we work with the client all the way from the designing stage through final construction to ensure they get exactly what they want down to the smallest detail. In the initial design stage, we discuss with the client what they would like to have included in their custom catamaran. Then, we draw up preliminary sketches based on their ideas and our design experience. We can offer clients several different options for different aspects of the boat. Once an overall structural design is agreed upon, construction can begin. The study plan below is our OFFSHORE 52 POWERCAT which we built, and is now named the SS GOODLIFE. The SS GOODLIFE project is an excellent example of how small changes can be made after construction has begun. ​During construction the client decided they would like an enclosed fly bridge. We then altered the design to accommodate their new design wants. ​Below is a study plan of what the SS GOODLIFE looked like when construction was complete. Note the difference between the orginial study plan and the final study plan.